pr + b/2, Shewalton sand pit, Meadowhead Road (NS 333360), 06/07. ad, River Irvine, Rivergate Shopping Centre (NS 319387), 08/07. pr + b/7, 'Magnum Pond', Irvine Beach Park (NS 307377), 08/07. pr + b/5, Ladyton Loch (NS 487373), 09/07. juv, Oldhall Pools SWT (NS 337364), 06/07. pr incubating, Ladyton Loch (NS 487373), 09/07. ad + juv, Tarryholme Pond (NS 329377), 08/07. Successful breeding at one of the few Ayrshire sites for this species. 1 N, Langlands Farm (NS 387428), 01/07. 1, River Irvine, Holmsford Bridge-Shewalton (NS 357377-NS 341372), 06/07. 3, circling over Dreghorn old pit bings, between A71 & River Irvine (NS 347371), 06/07. 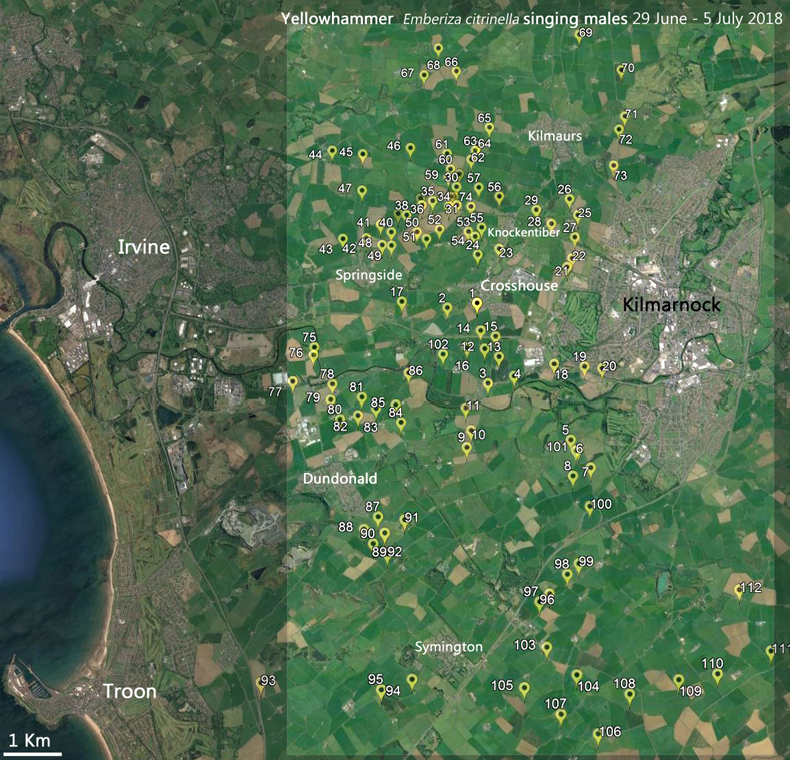 1, circling over Crosshouse and calling, 23:50h, 28/06. 2, circling over South Woodhill (NS 410395), 30/06. 1, Carmel Water, Knockentiber Viaduct (NS 404396), 30/06. 2, Capringstone (NS 357389), 02/07. 2, River Irvine, Laigh Milton Viaduct (NS 383370), 03/07. juv, Capringstone (NS 357389), 06/07. juv, River Irvine, Holmsford Bridge-Shewalton (NS 357377-NS 341372), 06/07. 2 juvs, Shewalton sand pit, Meadowhead Road (NS 333360), 06/07. 2, fishing at 22:34h, River Irvine, Holmsford Bridge-GSK, 07/07. 1, Carmel Water, Knockentiber Viaduct (NS 403396), 09/07. pr + b/3, north-east corner of Shewalton Wood SWT (NS 351360), 06/07. f + 2 juvs, Capringstone (NS 357389), 02/07. f + 2 juvs, Capringstone (NS 357389), 06/07. m, 'Magnum Pond', Irvine Beach Park (NS 307377), 08/07. Presumably an early returning individual. 9 (inv 7 juvs), Capringstone (NS 357389), 06/07. f + b/6, River Irvine, Holmsford Bridge-Shewalton (NS 357377-NS 341372), 06/07. 3, Oldhall Pools SWT (NS 337364), 06/07. 15, Tarryholme Pond (NS 329377), 08/07. 28, River Irvine, Rivergate Shopping Centre (NS 319387), 08/07. 10, Ladyton Loch (NS 487373), 09/07. pr, 'Magnum Pond', Irvine Beach Park (NS 307377), 08/07. f + b/12, River Irvine, Laigh Milton Mill (NS 382373), 03/07. Rare, compared with 25 years ago. 1, calling east of Walston (NS 467406), 09/07. 1 crowing m, Muirhouses (NS 356398), 30/06. 1 crowing m, near Broomhill (NS 372338), 02/07. 1 crowing m, Wallace's Monument, Barnweil Hill (NS 406294), 04/07. 1 crowing m, River Irvine, Holmsford Bridge-Shewalton (NS 357377-NS 341372), 06/07. 1 crowing m, Ladyton Loch (NS 487373), 09/07. f, mobbed by Swallows, River Irvine, Laigh Milton Mill (NS382372), 29/06. 1, Cualdhame (NS 378378), 29/06. 1, Bonnyton-Knockentiber disused railway line (NS 419387-NS 400397), 30/06. 1, over disused railway line at Fergushill (NS 388404), 01/07. 1, Stacklawhill (NS 372437), 01/07. 1, Barnahill (NS 374428), 01/07. 2, Haghouse Bridge-Shaw Bridge (NS 422420-NS 423419), 01/07. 1, Kirktoun (NS 417407), 01/07. 1, North Woodhill (NS 410398), 01/07. 1, near Broomhill (NS 372338), 02/07. 1, Catcraig Plantation (NS 373327), 02/07. 1, Townend of Caprington (NS 409349), 02/07. pr, with nest of well-grown young, Coodham, 04/07. 1, Craigie (NS 427324), 04/07. 1, Todrigs Bridge-Caprington Mains (NS 405357), 04/07. 3, River Irvine, Holmsford Bridge-Shewalton (NS 357377-NS 341372), 06/07. 1, north-east corner of Shewalton Wood SWT (NS 351360), 06/07. 1, Oldhall Pools SWT (NS 337364), 06/07. 1, Shewalton sand pit, Meadowhead Road (NS 333360), 06/07. Calls from Common Buzzard nestlings with an adult overhead. 1, north side of Crosshouse Hospital (NS 403387), 30/06. 1, Auchenharvie Castle, Torranyard (NS 363443), 01/07. pr + b/4, Capringstone (NS 357389), 06/07. pr, north-east corner of Shewalton Wood SWT (NS 351360), 06/07. 1 calling, Shewalton sand pit, Meadowhead Road (NS 333360), 06/07. ad + 2 juvs, Tarryholme Pond (NS 329377), 08/07. 2 prs (b/2, b/1), Ladyton Loch (NS 487373), 09/07. pr, Ladyton Loch (NS 487373), 09/07. 1, Townend of Caprington-Ditton (NS 409345), 29/06. pr, Busbie Holdings (NS 396387), 30/06. 1, North Woodhill (NS 411398), 30/06. pr + b/1, Altonhill (NS 418398), 01/07. 1, River Irvine, Laigh Milton Viaduct (NS 383370), 03/07. 6, Templeton (NS 394347), 04/07. 1, over Crosshouse (NS 393380), 06/06. 1, over Crosshouse (NS 393380), 08/06. 2 S, Gailes Marsh SWT (NS 326356), 08/07. 1, mobbing passing corvids, Craig Cottage (NS 385375), 29/06. 8 ad + b/2, Capringstone (NS 357389), 06/07. 1 S, Irvine Beach Park-Gailes (NS 311371), 08/07. 1, Capringstone (NS 357389), 02/07. pr + b/3, River Irvine, Laigh Milton Mill (NS 382373), 29/06. 7 ads + juv, Capringstone (NS 357389), 06/07. ad + juv, Shewalton sand pit, Meadowhead Road (NS 333360), 06/07. ad, Tarryholme Pond (NS 329377), 08/07. 10, 'Magnum Pond', Irvine Beach Park (NS 307377), 08/07. 4, 'Magnum Pond', Irvine Beach Park (NS 307377), 08/07. One or two overhead in most areas. 5, Busbiehill (NS 385393), 30/06. 13, Capringstone (NS 357389), 06/07. c30, Ayrshire Recycling Centre, Shewalton (NS 336365), 06/07. 10, Shewalton sand pit, Meadowhead Road (NS 333360), 06/07. Probably nesting on the roof of South Newmoor Industrial Estate (NS 337387), 08/07. 10, Tarryholme Pond (NS 329377), 08/07. Nesting (chicks seen), Rivergate Shopping Centre, Irvine (NS 319387), 08/07. 152 (4 fledglings), 'Magnum Pond', Irvine Beach Park (NS 307377), 08/07. A few overhead in most areas. 22, Busbiehill (NS 385393), 30/06. c300, Ayrshire Recycling Centre, Shewalton (NS 336365), 06/07. 189, Shewalton sand pit, Meadowhead Road (NS 333360), 06/07. 3, Tarryholme Pond (NS 329377), 08/07. 37, 'Magnum Pond', Irvine Beach Park (NS 307377), 08/07. 2, Shewalton sand pit, Meadowhead Road (NS 333360), 06/07. 1, 'Magnum Pond', Irvine Beach Park (NS 307377), 08/07. Common around farms and urban areas. 1, Arrothill (NS 400360), 29/06. pr, Kilmarnock Abattoir unclassified road, N of Caprington Estate (NS 411365). 1 singing m, beeches near Springside end, Knockentiber-Springside disused railway line (NS 375395), 06/07. pr, Dreghorn old pit bings, between A71 & River Irvine (NS 347371), 06/07. 3 singing mm, Bonnyton-Knockentiber disused railway line (NS 419387-NS 400397), 30/06. 7 singing mm, Knockentiber-Springside disused railway line (NS 400397-NS 370392), 30/06. ad, Corsehouse Mount (NS 360384), 22:12h, 07/07. 4, screaming party over Kilmaurs Road, Altonhill, Kilmarnock (NS 423397), 30/06. 2, over Crosshouse most nights (NS 393380), 28/06-10/07. 8, Dreghorn (NS 358379), 08/07. 4, Grassyards Road, Kilmarnock, 09/07. 1, Walston (NS 467407), 09/07. pr, at one site on River Irvine. 3 prs located on Annick Water. 1, in lone hedgerow ash, Craigrethill (NS 372309), 02/07. 1, Shewalton Wood SWT (NS 337357-NS 352360), 06/07. 1, Oldhall Ponds (NS 338364), 08/07. 1 singing m, Carmel Bank (NS 388378), 29/06. 1 singing m, Muirhouse (NS 387370), 29/06. 2 singing mm, Earlston (NS 411347), 29/06. 1 singing m, Fortacres (NS 399341), 29/06. 1 singing m, Busbie Cottages (NS 393388), 30/06. 2 singing mm, Knockentiber-Springside disused railway line (NS 400397-NS 370392), 30/06. 1 singing m, Shaw Bridge (NS 423418), 01/07. 1 singing m, Townend of Caprington (NS 409349), 02/07. 1 singing m, West Moorfield Cottage (NS 395373), 02/07. 1 singing m, south-west side of Crosshouse (NS 392377), 03/07. 1 singing m, Burnbank (NS 402313), 04/07. 1 singing m, Laigh Langside (NS 413313), 04/07. 1 singing m, Knockentiber-West Plann (NS395394), 06/07. 3 singing mm, Knockentiber-Springside disused railway line (NS 400397-NS 370392), 08/07. 1 singing m, Gailes Marsh SWT (NS 326356), 08/07. 2, Garrier Burn, West Plann (NS388395), 30/06. 40+, Annick Water, Rashillhouse (NS 384433), 01/07. 2, Carmel Water, Shaw Bridge (NS 423418), 01/07. 6 AON, River Irvine, Holmsford Bridge-Shewalton (NS 357377-NS 341372), 06/07. 9+, River Irvine, Holmsford Bridge-Shewalton (NS 357377-NS 341372), 06/07. 6, Dreghorn old pit bings, between A71 & River Irvine (NS 347371), 06/07. 7, confluence of Annick Water/River Irvine (NS 325377), 08/07. Min 12 AON (60 holes in total), Gailes Marsh SWT (NS 326356), 08/07. 6, Ladyton Loch (NS 487373), 09/07. 5, Milton-Grougar Row (NS 475375-NS 473377), 09/07. Pairs noted around most farms. 12, River Irvine, Laigh Milton Mill (NS382372), 29/06. 8, Arrothill (NS 400360), 29/06. 22, inc fledged juvs, Earlston (NS 407351), 29/06. 9, inc fledged juvs, Townend of Caprington-Ditton (NS 409345), 29/06. 5, Templeton (NS 393345), 29/06. 10, Bonnyton-Knockentiber disused railway line (NS 419387-NS 400397), 30/06. 20, Knockentiber-Springside disused railway line (NS 400397-NS 370392), 30/06. 16+, Muirhouses (NS 356398), 30/06. 16, inc juvs, Springside (NS 373393), 02/07. 24, inc juvs, Kerrix, Symington (NS 375308), 02/07. 34, Craigie (NS 427324), 04/07. pr + b/4, Shewalton Wood SWT (NS 337357-NS 352360), 06/07. 29, pre-roosting gathering, Knockentiber-Springside disused railway line, 21:54h, 07/07. c12, over Crosshouse most nights (NS 393380), 28/06-10/07. 15, north-east corner of Shewalton Wood SWT (NS 351360), 06/07. Within pastoral farmland, restricted to sites with rough/undisturbed grassland. 1 singing m, in Juncus rush marsh in farmland, Peatland (NS 391350), 29/06. 1 singing m, over rough grassland, West Plann (NS 392394), 02/07. 1 singing m, near Broomhill (NS 372338), 02/07. 1 singing m, over rough grazing, Plewlands-Caldrongill (NS 423308), 04/07. 1, east side of Busbiehill (NS 390393), 06/07. 3 singing mm, Dreghorn old pit bings, between A71 & River Irvine (NS 347371), 06/07. 1, with food for young, Dreghorn old pit bings, between A71 & River Irvine (NS 347371), 06/07. 1 singing m, Shewalton Wood SWT (NS 337357-NS 352360), 06/07. 2, Irvine Beach Park-Gailes (NS 311371), 08/07. pr + b/2, River Irvine, Laigh Milton Mill (NS 382372), 29/06. ad + b/4, Garrier Burn, West Plann (NS 388395), 30/06. ad, Annick Water, Rashillhouse (NS 384433), 01/07. 1, flew downstream, Kilmarnock Water, Kilmarnock Viaduct (NS 431382), 09/07. 1, with food for young, Warwickdale (NS 368403), 30/06. 1, Southhook Bridge (NS 387398), 02/07. 1 m, Corraith (NS 365318), 02/07. ad + 2 juvs, River Irvine, Laigh Milton Mill (NS 383373), 03/07. 1 m, Springside-Dreghorn disused railway line (NS 370392-NS 360388), 06/07. 4 juvs, Capringstone (NS 357389), 06/07. 1, Wallace's Monument, Barnweil Hill (NS 406294), 04/07. 1, Townholm, Kilmarnock (NS 436389), 09/07. Encountered on most farms, except in excessively cropped hedgerows. Still a few individuals singing. 8 singing mm, Bonnyton-Knockentiber disused railway line (NS 419387-NS 400397), 30/06. 1, carrying faecal sac, Haysmuir (NS 380437), 01/07. Fledged brood, Knockentiber-Springside disused railway line (NS 400397-NS 370392), 07/07. juv, Kilmarnock Water, Kilmarnock Viaduct (NS 431382), 09/07. Encountered on farms with scrub and overgrown hedgerows. Still a few individuals singing. 1, carrying faecal sac, Bonnyton-Knockentiber disused railway line (NS 419387-NS 400397), 30/06. Fledged brood, River Irvine, Holmsford Bridge-Shewalton (NS 357377-NS 341372), 06/07. juv, Irvine Beach Park-Gailes (NS 311371), 08/07. Common. Still a few individuals singing. 2 singing mm, Annick Water, Rashillhouse (NS 384433), 01/07. 1, with food for young, Ayrshire Recycling Centre, Shewalton (NS 336365), 06/07. 1 singing m, Capringstone (NS 355387), 08/07. Encountered on farms with mature or overgrown hedgerows. Still a few individuals singing. 1 singing m, Bonnyton-Knockentiber disused railway line (NS 419387-NS 400397), 30/06. 1 singing m, disused railway line at Fergushill (NS 388404), 01/07. 1 singing m (inc Oystercatcher mimicry), Capringstone (NS 357389), 06/07. 1 singing m, Shewalton sand pit, Meadowhead Road (NS 333360), 06/07. 1 singing m, Corsehill Mount, 22:15h, 07/07. 2, River Irvine, Holmsford Bridge-Shewalton (NS 357377-NS 341372), 06/07. 1 singing m, Shewalton Woods SWT, 23:10h, 07/07. 1 singing m, Whitelee Forest, NE of Moscow (NS 506418), 09/07. Still a few (presumably unpaired) individuals singing. 1 singing m, in Typha marsh, Moorfield Industrial Estate (NS 403368), 29/06. 1 singing m, in Phragmites/Typha marsh, Moorfield North Industrial Estate (NS 403373), 29/06. 1 singing m, Knockentiber-Springside disused railway line (NS 400397-NS 370392), 30/06. 1 calling, Carmel Water, Shaw Bridge (NS 423418), 01/07. 1 calling, from willowherb patch, Knockentiber-West Plann (NS395394), 06/07. 2 calling, River Irvine, Holmsford Bridge-Shewalton (NS 357377-NS 341372), 06/07. 3 singing mm, Shewalton Wood SWT (NS 337357-NS 352360), 06/07. 2 juvs, Oldhall Pools SWT (NS 337364), 06/07. 1 singing m, in full song at 23:43, Greenside Avenue, Springside, 07/07. 1 singing m, confluence of Annick Water/River Irvine (NS 325377), 08/07. 1 calling, Irvine Beach Park-Gailes (NS 311371), 08/07. 1 singing m, Ladyton Loch (NS 487373), 09/07. Still a few individuals singing. 1, alarm calling, Townend of Caprington-Ditton (NS 409345), 29/06. 1 singing m, West Moorfield Cottage (NS 395373), 29/06. 2 singing mm, Bonnyton-Knockentiber disused railway line (NS 419387-NS 400397), 30/06. 1 singing m, Warwickdale (NS 368403), 30/06. 1 singing m, Langlands Farm (NS 387428), 01/07. 1 singing m, Annick Water, Rashillhouse (NS 384433), 01/07. 1 singing m, Brownlee/Craigs (NS 373330), 02/07. 2 singing mm, Whitelees (NS 399317), 04/07. 1 singing m, Heughmill (NS 403308), 04/07. 1 singing m, Wallace's Monument, Barnweil Hill (NS 406294), 04/07. 1 singing m, Fairwells (NS 440311), 04/07. 1 singing m, Broadyards Farm (NS 437316), 04/07. Fledged brood, Whitelee Forest, NE of Moscow (NS 500414), 09/07. f, Dundonald Castle (NS 363344), 10/07. Fledged brood, Bonnyton-Knockentiber disused railway line (NS 419387-NS 400397), 30/06. 1 singing m, Carmel Water, Crosshouse (NS 394385), 01/07. 1 singing m, Dreghorn (NS 359386), 02/07. 2 singing mm, Corsehill Mount (NS 359282), 02/07. 1 singing m, Coodham, 04/07. 1 singing m, Barnweil (NS 411303), 04/07. 1 singing m, in crab apple/elderflower, Springside-Dreghorn disused railway line (NS 370392-NS 360388), 06/07. 2 singing mm, Corsehill Mount (NS 359282), 06/07. 1 singing m, River Irvine, Holmsford Bridge-Shewalton (NS 357377-NS 341372), 06/07. 5 singing mm, Dreghorn-Irvine disused railway line, 08/07. 1 singing m, Milgarholm Park, Irvine (NS 327380), 08/07. 3 singing mm, confluence of Annick Water/River Irvine (NS 325377), 08/07. 2 singing mm, Tarryholme Pond (NS 329377), 08/07. 1 singing m, Townholm, Kilmarnock (NS 434388), 09/07. 1 singing m, Loudoun Kirk (NS 492373), 09/07. 1 singing m, Caprington Mains (NS 404359), 29/06. 1 singing m, Greenhill (NS 400390), 30/06. 1 singing m, Catcraig Plantation (NS 373327), 02/07. 1 calling, Wallace's Monument, Barnweil Hill (NS 406294), 04/07. 1 singing m, Craigie quarry (NS 424325), 04/07. 1 singing m, Oldhall Pools SWT (NS 337364), 06/07. 1 singing m, Knockentiber-Springside disused railway line (NS 400396), 09/07. 2 singing mm, Dundonald Castle (NS 363344), 10/07. 1 singing m, Fardalehill (NS 409384), 30/06. 7 singing mm, Bonnyton-Knockentiber disused railway line (NS 419387-NS 400397), 30/06. 6 singing mm, Knockentiber-Springside disused railway line (NS 400397-NS 370392), 30/06. Fledged broods (inc b/5), Knockentiber-Springside disused railway line (NS 400397-NS 370392), 30/06. 1 singing m, Busbiehill (NS 392393), 30/06. 1 singing m, Corsehill Mount (NS 359282), 02/07. 2 singing mm, Catcraig Plantation (NS 373327), 02/07. 1 singing m, disused railway line at Fergushill (NS 388404), 06/07. Several fledged broods, Shewalton Wood SWT (NS 337357-NS 352360), 06/07. 3 singing mm + fledged brood, Whitelee Forest, NE of Moscow (NS 506418), 09/07. Calls from a brood of five recently fledged juveniles. Away from areas of conifers, some males were hearding singing from single, isolated conifers on farms. 1 singing m, Paddocklaw (NS 374407), 30/06. Fledged brood, Dreghorn (NS 359386), 02/07. Fledged brood, Corsehill Mount (NS 359282), 02/07. 1 singing m, in garden, Earlston (NS 407354), 02/07. 1 singing, Heughmill (NS 403305), 04/07. 2 singing mm, Todrigs Bridge-Caprington Mains (NS 405357), 04/07. 3 singing mm, Corsehill Mount (NS 359282), 06/07. Fledged brood, Loudoun Kirk (NS 492373), 09/07. 2 fledged broods, Knockentiber-Springside disused railway line (NS 400397-NS 370392), 30/06. 22, flew over B7081 west of Dreghorn Roundabout (NS 359386), 02/07. 12+, Shewalton Wood SWT (NS 337357-NS 352360), 06/07. Fledged brood, confluence of Annick Water/River Irvine (NS 325377), 08/07. Heard, Caprington Mains (NS 404359), 29/06. Heard, Todrigs Bridge-Caprington Mains (NS 405357), 04/07. Fledged brood, in pines, Capringstone (NS 357389), 06/07. Fledged brood, Shewalton Wood SWT (NS 337357-NS 352360), 06/07. 2 singing mm, Whitelee Forest, NE of Moscow (NS 500414), 09/07. Fledged brood, Annick Water, Rashillhouse (NS 384433), 01/07. Fledged brood, Springside-Dreghorn disused railway line (NS 370392-NS 360388), 06/07. Fledged brood, Craig Cottage (NS 385375), 29/06. pr + b/3, Shewalton Wood SWT (NS 352359), 06/07. Fledged brood, Dreghorn-Irvine disused railway line (NS 359386), 08/07. Fledged brood, Gailes Marsh SWT (NS 326356), 08/07. Fledged brood, Kilmarnock Water, Lauder Bridge, Dean Park (NS 435391), 09/07. Fledged brood, Milton-Grougar Row (NS 475375-NS 473377), 09/07. 1, Whitelee Forest, NE of Moscow (NS 506418), 09/07. 147, Springside-Dreghorn disused railway line (NS 370392-NS 360388), 06/07. c40, Ayrshire Recycling Centre, Shewalton (NS 336365), 06/07. Fledglings still dependent on adults. 110, Knockentiber-Springside disused railway line/Southhook (NS 384399), 02/07. 160, West Raws (NS 474396), 09/07. pr + b/3, Bonnyton-Knockentiber disused railway line (NS 419387-NS 400397), 30/06. pr + b/3, Old Middleton (NS 363409), 30/06. 1, Earlston (NS 407351), 29/06. 1, Busbiehill (NS 385393), 30/06. 1, Knockentiber-Springside disused railway line (NS 396397), 08/07. 1, over Dundonald Castle, 10/07. 160 juvs, Haysmuir (NS 380437), 01/07. 60 juvs, Southook Bridge, Knockentiber-Springside disused railway line (NS 387398), 06/07. 80 juvs, Hillhouse (NS 457401), 09/07. A scarce breeding bird in Ayrshire, with the stronghold in the centre of the county. Possibly overlooked elsewhere. Total of 40 pairs located. pr, nesting Carmel Bank (NS 388378), 29/06. pr, nesting in dead oak, Rowanhill (NS 390344), 29/06. pr, nesting in ash, Knockentiber-Altonhill unclassified road (NS 400392), 30/06. pr nesting, in dead tree near start of Knockentiber-Springside disused railway line (NS 396397), 30/06. 6 prs, in beeches at Springside end, Knockentiber-Springside disused railway line (NS 400397-NS 370392), 30/06. pr, Paddocklaw (NS 374407), 30/06. pr, nesting in ash, Paddocklaw-Southhook (NS 379405), 30/06. pr, Warwickdale (NS 368403), 30/06. 6 prs, nesting in ash/oak/beech, Fergushill-Busbie Mains-Laigh Langmuir (NS 388404-NS 395414), 01/07. 2 prs, Alton Bridge (NS 390422), 01/07. 6 prs, Aulton-Aultonhead (NS 390421-NS 385423), 01/07. pr, nesting in roadside ash, south of Girgenti Farm (NS 373431), 01/07. 2 prs, Barnahill (NS 374428), 01/07. pr, nesting in ash, Buistonend Cottage (NS 412431), 01/07. 2 prs, Buistonend (NS 415432), 01/07. 2 prs, Bellsland Farm (NS 420417), 01/07. pr, Wallace's Monument, Barnweil Hill (NS 406294), 04/07. 2 prs, Milton-Grougar Row (NS 475375-NS 473377), 09/07. pr, nesting in beech, Tawthorn (NS 467389), 09/07. pr, Muirhouse (NS 387370), 29/06. 1 singing m, Earlston (NS 407351), 29/06. 1 singing m, Carmel Water, Knockentiber Viaduct (NS 404396), 30/06. 1 singing m, Old Middleton (NS 363409), 30/06. 1 singing m, Harperland (NS 374358), 02/07. 2 singing mm, Craigie (NS 427324), 04/07. 1 singing m, Springside-Dreghorn disused railway line (NS 370392-NS 360388), 06/07. Common - present around most farms. 3 singing mm, Knockentiber-Springside disused railway line (NS 400397-NS 370392), 30/06. 4, Shewalton Wood SWT (NS 337357-NS 352360), 06/07. 1 singing m, Dundonald Castle (NS 363344), 10/07. pr + singing m, Carmel Bank (NS 388378), 29/06. pr, Earlston (NS 411347), 29/06. pr + b/4, in rough grassland claimed for house building, near Fardalehill (NS 409384), 30/06. 1 m, Harperland (NS 374358), 02/07. pr, Low Wexford (NS 371307), 02/07. pr, Broadyards Farm (NS 437316), 04/07. pr + singing m, Craigie (NS 427324), 04/07. 1 singing m, east side of Busbiehill (NS 390393), 06/07. 4, West Plann, (NS 390396), 06/07. 2 prs, Dreghorn old pit bings, between A71 & River Irvine (NS 347371), 06/07. pr + juv, 'Magnum Pond', Irvine Beach Park (NS 307377), 08/07. 6 + 1 singing m, Shewalton Wood SWT (NS 337357-NS 352360), 06/07. 6, Whitelee Forest, NE of Moscow (NS 506418), 09/07. 2, Whitelee Forest, NE of Moscow (NS 506418), 09/07. 2 juvs, Springside-Dreghorn disused railway line (NS 370392-NS 360388), 30/06. Fledged brood, Drybridge (NS 359365), 02/07. pr + 2 juvs, Knockentiber-Springside disused railway line (NS 376393), 06/07. 1, Corsehill Mount (NS 359282), 06/07. pr + b/3, River Irvine, Holmsford Bridge-Shewalton (NS 357377-NS 341372), 06/07. 5, Shewalton Wood SWT (NS 337357-NS 352360), 06/07. 1 calling, Corsehill Mount (NS 359282), 08/07. pr + b/4, Whitelee Forest, NE of Moscow (NS 506418), 09/07. A widespread breeding bird in lowland Ayrshire with the highest densities associated with arable farming in the centre of the county. Decline noted in past 30 years. 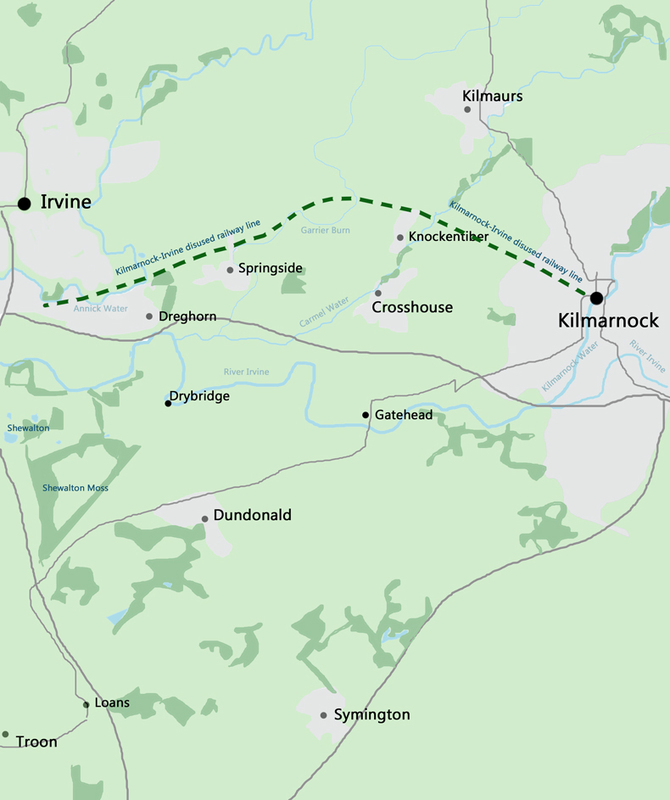 112 singing males were located on the western side of Kilmarnock. Of 106 square kilometres surveyed, 54 contained Yellowhammers. In terms of habitat, 22% were found in arable, 53% in pastoral, and 25% in mixed arable/pastoral. Still singing at 22:00h, Knockentiber-Springside disused railway line, 07/07. Phrases 2 and 3 form local and regional dialects, whereas phrase 1 is often specific to the individual (Hansen, 1985, Schön 1989, Hansen 1999, Rutkowska-Guz & Osiejuk 2004, Caro et al. 2009). Most males in this area have two song types. Two song types from one male, aprroximately 5.8 kilometres from the male above, recorded in a different year. 1 singing m, in farmland hedgerow, Muirmill (NS 392337), 29/06. 1 singing m, in Juncus rush marsh in farmland, Galrigside (NS 390351), 29/06. 2 singing mm, in Phragmites/Typha marsh, Moorfield North Industrial Estate (NS 401375, NS 403373), 29/06. 1 singing m, in Juncus rush marsh, Bonnyton-Knockentiber disused railway line (NS 419387-NS 400397), 30/06. 1 singing m, Garrier Burn, West Plann (NS 388395), 30/06. 1 singing m, south of Stacklawhill (NS 372437), 01/07. 1 singing m, in Juncus rush field, north of Stacklawhill (NS 370433), 01/07. 1 singing m, in rushy pasture, Barnahill (NS 374428), 01/07. 1 singing m, in rushy pasture, Townhead of Lambroughton (NS 401437), 01/07. 4 singing mm, Haghouse Bridge-Shaw Bridge (NS 422420-NS 423419), 01/07. 1 singing m, in farmland hedgerow, West Plann (NS 392394), 02/07. 2 singing mm, Juncus rush marsh along Harperland Burn, A759 near entrance to Fairlie Mains (NS 381354), 02/07. 1 singing m, in farmland hedgerow, Carmel Bank (NS 389379), 03/07. 1 singing m, east of Holm (NS 390381), 04/07. 1 singing m, in Juncus rush field, Cragie (NS 423320), 04/07. 1 singing m, Garrier Burn, Knockentiber-Springside disused railway line (NS 377394), 06/07. 1 singing m, in rank grassland, River Irvine, Holmsford Bridge-Shewalton (NS 353373), 06/07. 4 singing mm, Dreghorn old pit bings, between A71 & River Irvine (NS 347371), 06/07. b/4, Dreghorn old pit bings, between A71 & River Irvine (NS 344371), 06/07. 2 singing mm, south corner of Shewalton Wood SWT (NS 339340), 06/07. 2 singing mm, north-east corner of Shewalton Wood SWT (NS 351360, NS 349361), 06/07. 1 singing m, Juncus marsh near start, Knockentiber-Springside disused railway line (NS 396397), 08/07. 1 singing m, in rank grassland with Giant Hogweed, confluence of Annick Water/River Irvine (NS 325377), 08/07. 1 singing m, Tarryholme Pond (NS 329377), 08/07. 1 singing m, in Juncus, S of Rushaw (NS 492415), 09/07. 2 singing mm, Ladyton Loch (NS 487373), 09/07. Song/stridulation from two to three males on short, rabbit grazed grassland of former sand-extraction pit. A continuous series of short, harsh chirps of 1.0-1.3 seconds in duration. Song/stridulation from a male in long grassland along the course of a former railway line. A series oh high-pitched clicks (~19/sec), begining quietly then increasing in volume, in long bursts of up to 20 seconds. Song/stridulation from a male in rabbit-grazed grassland behind Marram Grass dune system. A 12 second series of 0.4 sec soft, buzzes, increasing in volume before abruptly ending. Caro, S. P., Keulen, C. & Poncin, P. 2009. 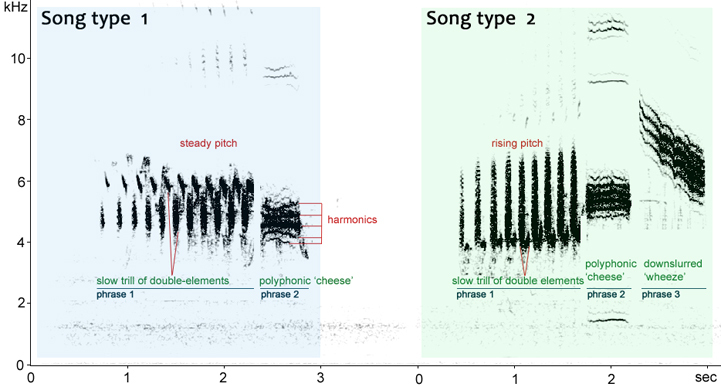 Song repertoires in a Western European population of Yellowhammers Emberiza citrinella. Acta Ornithol. 44: 9–16. Hansen, P. 1985. Geographic song variation in the Yellowhammer (Emberiza citrinella). Nat. Jutl. 21: 209–219. Hansen, P. 1999. Long-term stability of song elements in the Yellowhammer Emberiza citrinella. Bioacoustics 9: 281–295. Rutkowska-Guz, J. M. & Osiejuk, T. S. 2004. Song structure and variation in Yellowhammers Emberiza citrinella from Western Poland. Polish J. Ecol. 52: 333–345. Schön, R. 1989. Dialekte, Individualität und Gesangslernen bei der Goldammer (Emberiza citrinella L.). Unpublished D. Phil. thesis. Universität Wien.